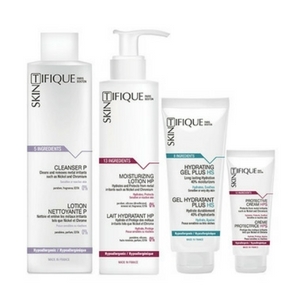 This pack contains Skintifique’s 4 star products, that work together to protect, moisturise, help repair and cleanse sensitive, allergic or damaged skin. Apply extensively on a dry, irritated or sensitive skin. Prevents metals (Nickel, Chromium…) from penetrating the epidermis while letting the skin breathe. Efficient for up to 14 hours. Apply as often as necessary the cream on skin that risks being exposed to irritant metals. A very pure moisturising lotion which hydrates and protects the skin from frequent aggressions that can irritate the skin: pollution, metals (Nickel…). This extremely pure, soft and efficient micellar water cleanses, removes makeup, traces of pollution and metals (Nickel…). 4 products to protect, moisturise, soothe and cleanse sensitive, allergic or damaged skin. This pack contains Skintifique’s 4 star products, that work together to protect, moisturise, help repair and cleanse sensitive, allergic or damaged skin. Skintifique products have extremely pure formulations, with a limited number of ingredients to minimise the risk of skin reaction. Each ingredient has been carefully selected for its safety profile. All the products in the Discovery Pack are: paraben free – metal free (no Nickel, Chromium or Cobalt…) – fragrance free – EDTA-free – BPA free (no phthalates, bisphenol, non-toxic plastic) – sulfates free (no SLS & SLES) – gluten free – silicone free (no dimethicone) – alcohol free – mineral oil free (petroleum free) – lanolin free. More than 78% of natural ingredients: Cleanser P (91.2%), Moisturising Lotion HP (78.8%). Protects and moisturises my skin ! I started using the Skintifique Moisturising Lotion HP for a period of time, almost every day. Being a person allergic to chrome and nickel, I realised that without it I would have big problems, but with its help, I protect the skin, but it and moisturises, leaving a pleasant smell. Skintifique Moisturising Lotion HP helps me wear objects, like the watch, without cause to my skin or my health different seriously problems. Thank you Skintifique for your Moisturising Lotion HP.